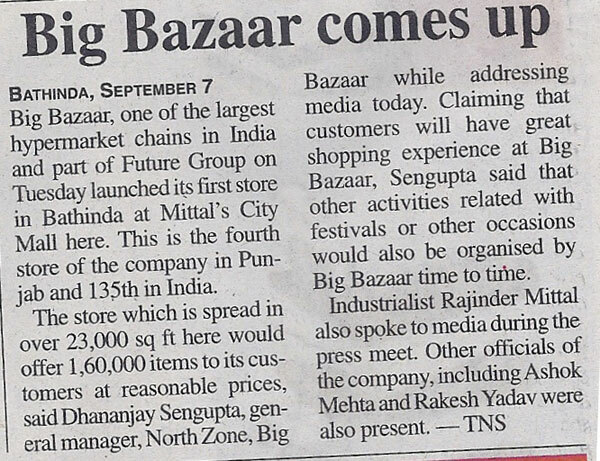 Big Bazaar, one of the largest hypermarket chains in India and part of Future Group on Tuesday launched its first store in Bathinda at Mittal’s City Mall here. This is the fourth store of the company in Punjab and 135th in India. The store which is spread in over 23,000 sq ft here would offer 1,60,000 items to its customers at reasonable prices, said Dhananjay Sengupta, general manager, North Zone, Big Bazaar while addressing media today. Claiming that customers will have great shopping experience at Big Bazaar, Sengupta said that other activities related to festivals or other occasions would also be organized by Big Bazaar time to time. Industrialist Rajinder Mittal also spoke to media during the press meet. Other officials of the company, including Ashok Mehta and Rakesh Yadav, were also present.